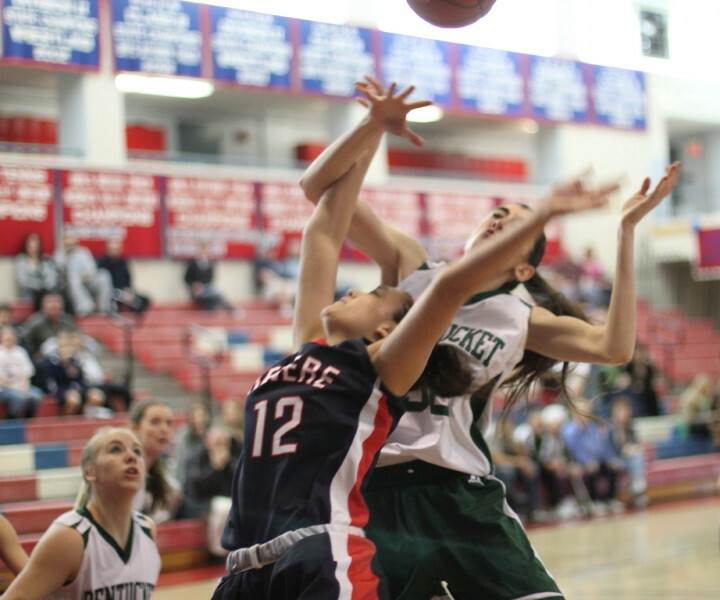 Tess Nogueira (10 points) breaks away with second half steal. 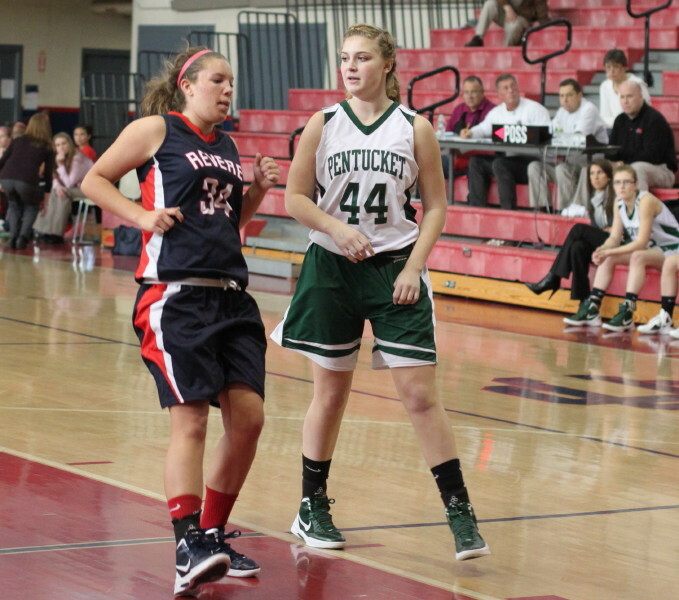 Kelsi McNamara (14 points) gets an open look along the baseline. 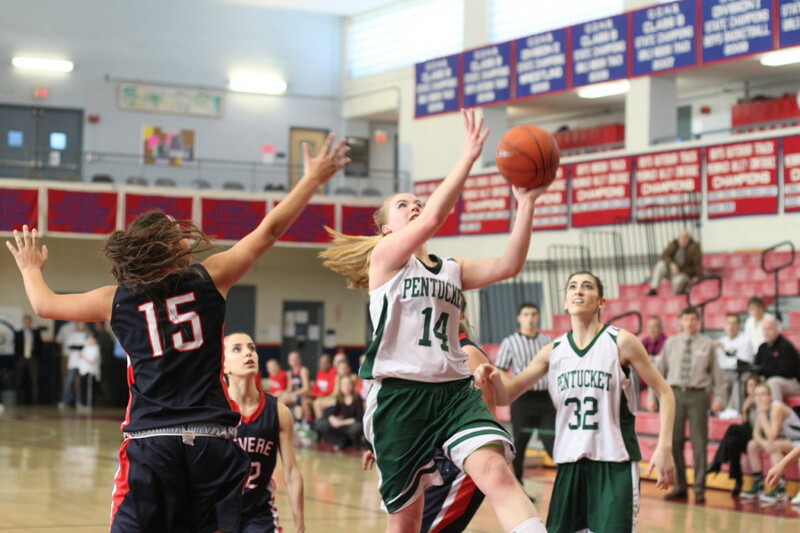 (Lawrence) What can you say about the Pentucket Sachems girls basketball team? 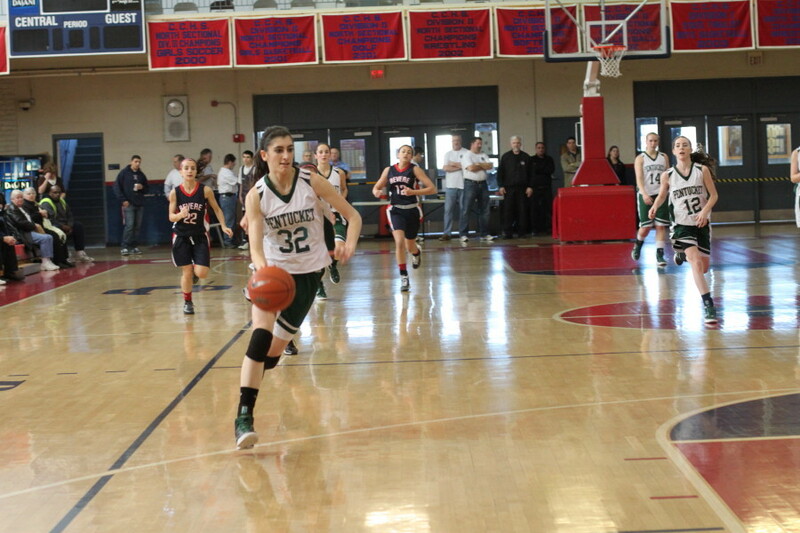 On an afternoon when key defender Sarah Higgins is on the sidelines (illness), high scoring Coley Viselli struggles to get four points, and the Sachems make just 4-of-25 3-point attempts, they still have enough to defeat Division 1 Revere, 50-27. This was the opener of the IAABO Board 130 Basketball Classic on Sunday afternoon at Central Catholic. Pentucket will return tomorrow afternoon to face the winner of the Archbishop Williams/Central Catholic game at 5:30PM. 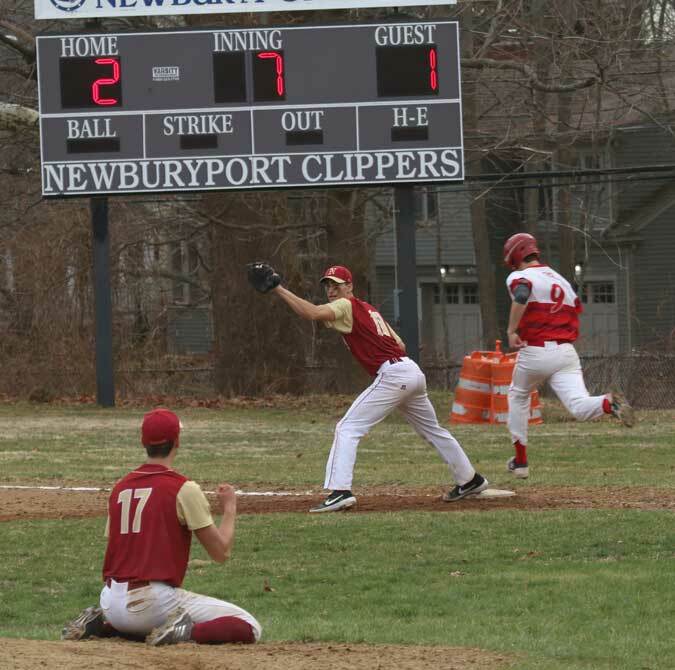 The Revere Patriots (10-7) came in having won six of their last seven in the Northeastern Conference North. They are probably happy that in the state tourney they’ll be in Division 1 and Pentucket will be in Division 3. 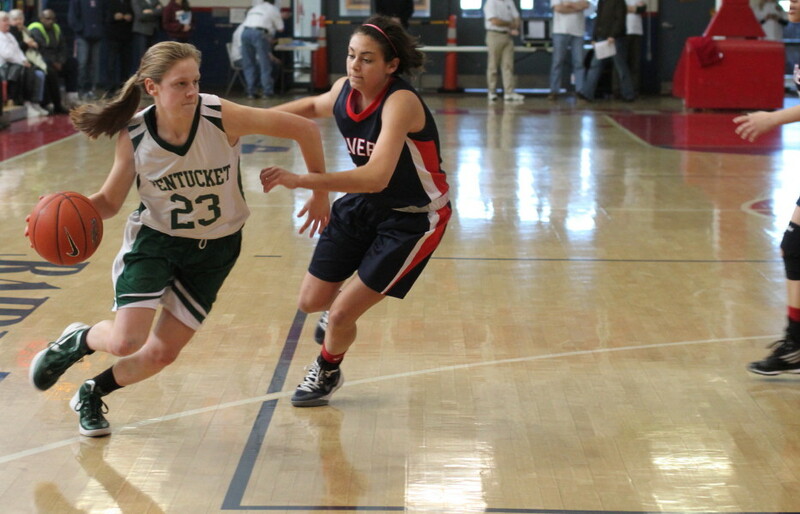 Pentucket (17-4) had their staple full-court pressure working from the outset. 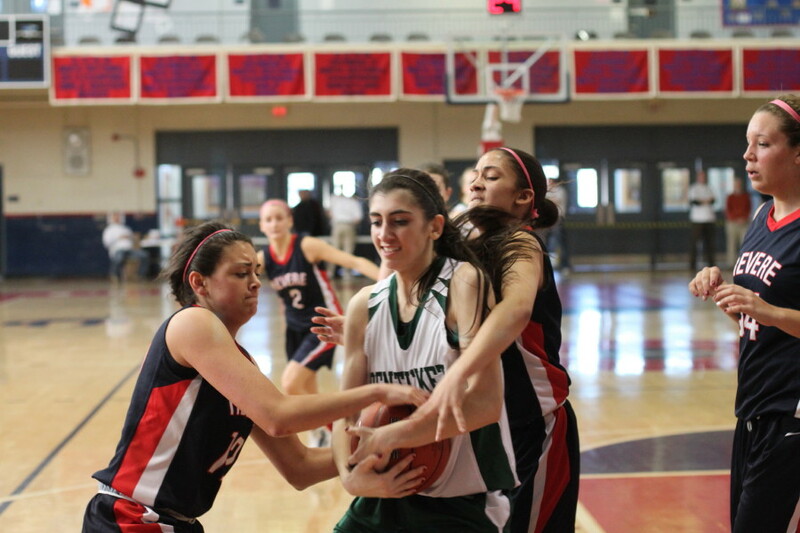 By game’s end they had forced the Lady Patriots into twenty-seven miscues. 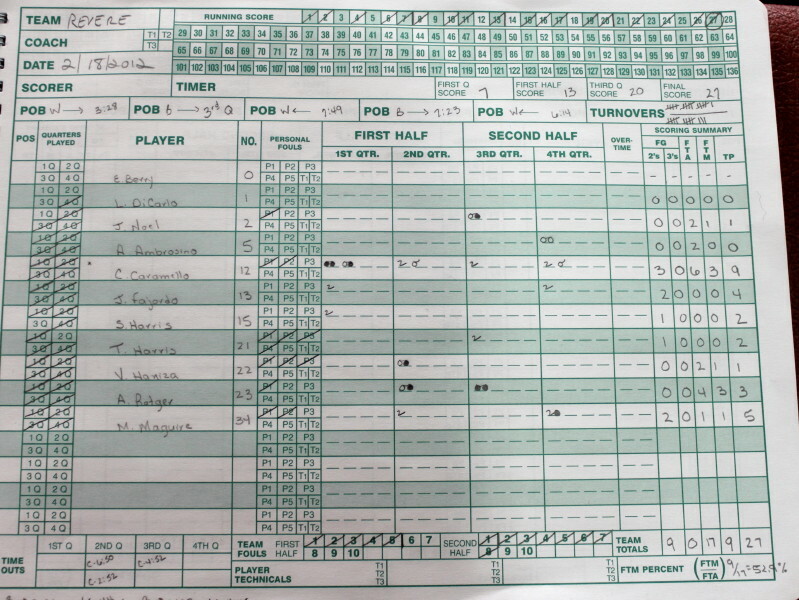 But in the first half of this game, the Revere turnovers didn’t lead directly to points while the Sachem long-range shooting was scary bad (2-for-19). Those two factors kept this game close (20-13 at the half). 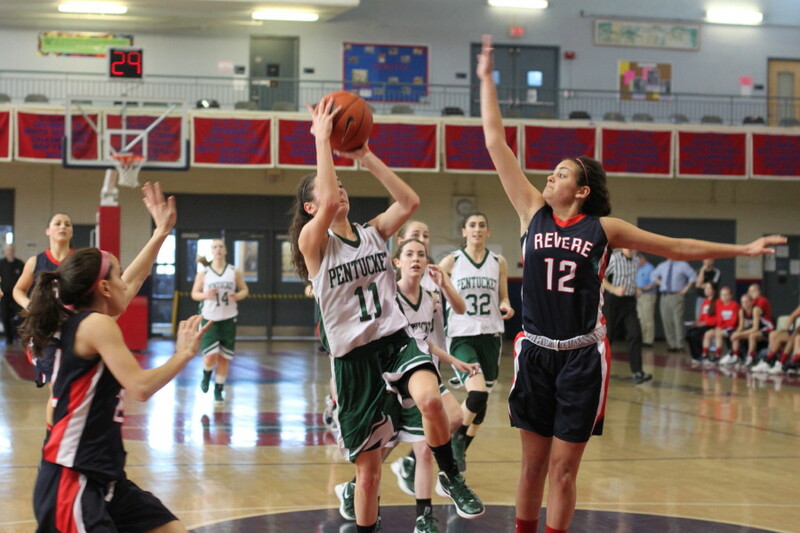 In fact, 1 ½ minutes into the second half, two Amy Rotger free throws had Revere still in this one, 22-17. The rest of that third quarter everything came together in a nice package for the Sachems and they went on a decisive 14-3 run. Pentucket’s first three scores in this surge were directly off of steals by Kelsi McNamara, Tess Nogueira, and Alex Moore. Next, Tess found room in close for a layup. 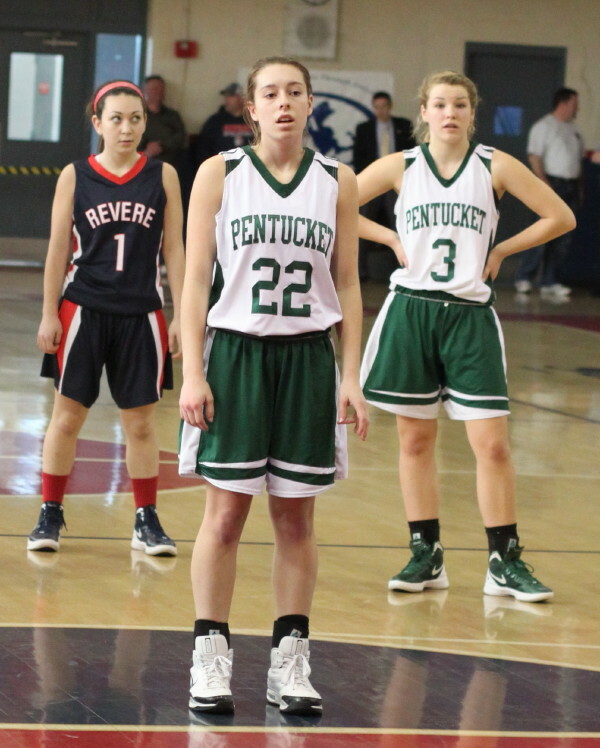 Revere stopped the bleeding (8-point run) temporarily with a Caitlyn Caramello layin but back came Pentucket with two of their four 3’s (Kelsi McNamara and Sydney Snow). The Sachems were clearly in command 36-20 after three quarters. 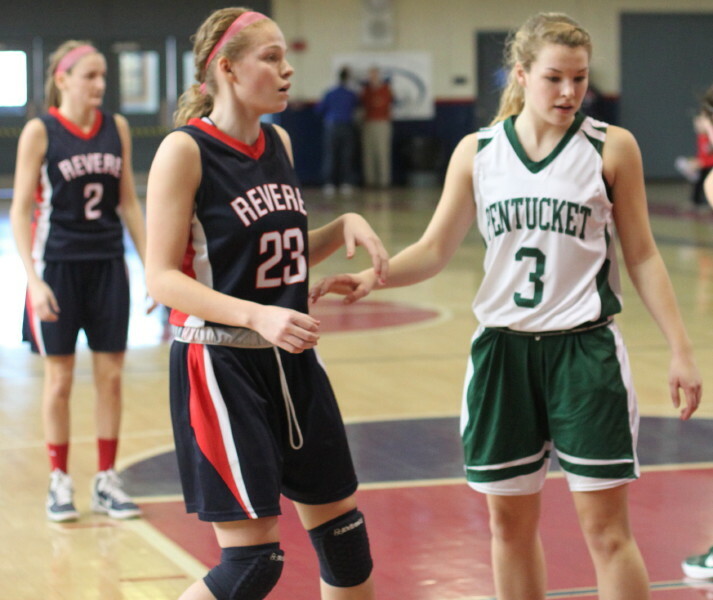 Revere was held scoreless for the first 3 ½ minutes of the final quarter partly because of four more turnovers. 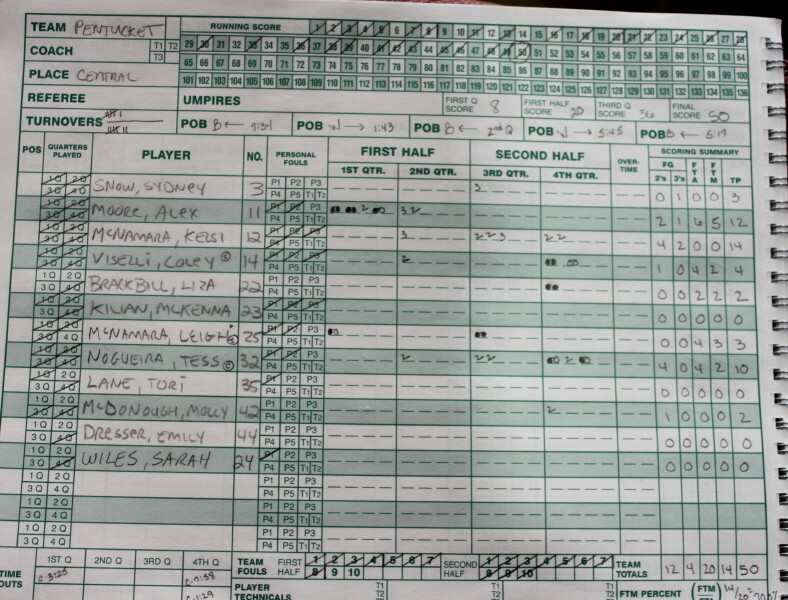 Meanwhile Pentucket was putting up ten unanswered points to get away even further, 46-20. Reserves dominated the rest of the game. The final score was 50-27. In a game where Coley Viselli struggled for points, Kelsi McNamara (14), Alex Moore (12) and Tess Nogueira (10) picked up the slack nicely. Freshman Kelsi had eleven of her points in the breakaway second half. 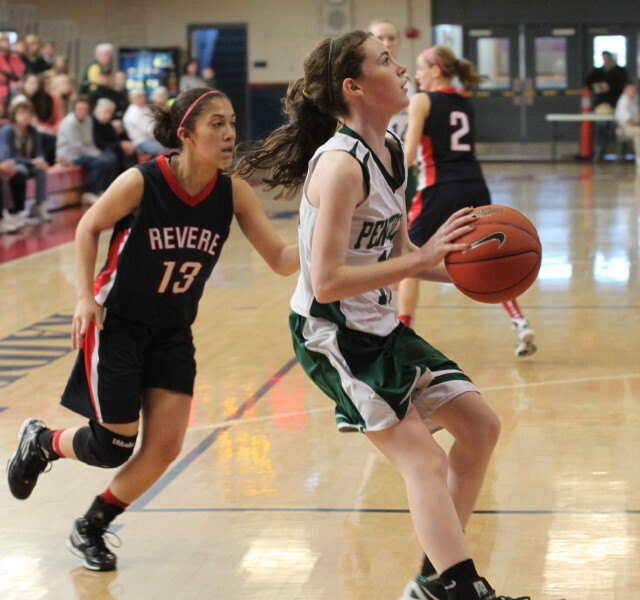 Caitlyn Caramello paced Revere with nine points. Michaela Maguire added five including a put-back just before the halftime buzzer. Pentucket is now on a nine-game winning streak. They have won fourteen of their last fifteen. The last time I saw them lose was in a state tournament game last year at Wilmington High School against St. Mary’s of Lynn the eventual D3 champ. 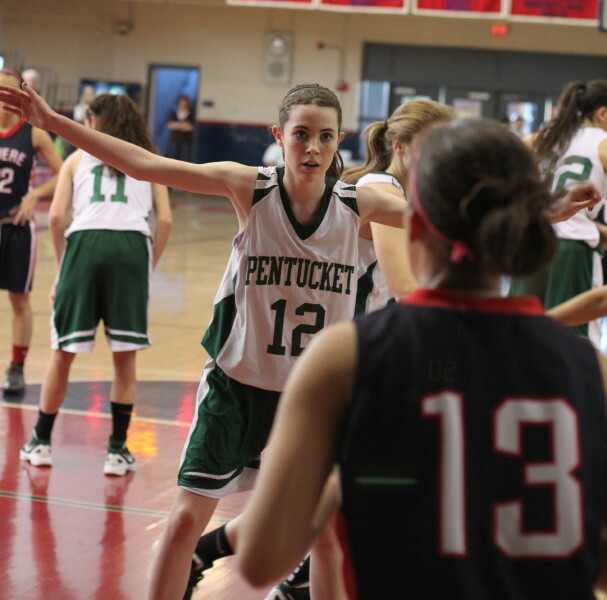 Can Pentucket be in the D3 state championship game at the Worcester Centrum in mid-March? Their multiple ways of hurting an opponent suggest to me that they can do it. We’ll see.